In Part 1 we saw how Leandro Bisiach came to dominate the Milanese trade in both new and old instruments, employing various fine makers in his workshop. It is difficult to pinpoint when and to what degree Leandro stopped making instruments himself. I believe that early in his career his input in the physical production of the instruments became minimal, though his concept and direction is evident in all instruments that left his workshop bearing his label. He certainly took care that his instruments bore his personal mark and differed substantially from anything his employees could manufacture in their own name. He must have learnt this from J.B. Vuillaume, whose instruments, apart from being notably better than anything his workers normally produced on their own, also differed from them in concept, size and in the fine detailing. They were also usually covered with a far superior varnish. After the Antoniazzi brothers left his employ, Leandro hired the young and talented Gaetano Sgarabotto, who worked for him from 1901 to 1905. Sgarabotto was one of the most illustrious and productive makers to work for the entrepreneur. He later pioneered the 20th-century Parma school on the principles of modern Lombardian violin construction as taught to him by Bisiach. With Sgarabotto’s arrival Bisiach more or less relinquished the post-Cremonese Antoniazzi principles of arching and modeling, creating flatter and more robust instruments along with several new models based on Amati–Rugeri and Guadagnini. Before Sgarabotto’s departure Bisiach had already employed Giuseppe Ornati, whose refined personal work represents yet another benchmark in 20th-century Milanese making. Ornati worked for Bisiach for a number of years on and off from around 1903 and his highly skilled hand and knowledge are pervasive in the Bisiach instruments of that period. Bisiach again exhibited instruments in international exhibitions, in Milan (1906) and Brussels (1910). Soon after this and until 1914, yet another great pair of hands appears in Bisiach’s production – those of Ferdinando Garimberti, a star pupil of Riccardo Antoniazzi. Interestingly, the hands that are most clearly discernable in all of Leandro Bisiach Sr.’s production are those of his very first and very last collaborators – Gaetano Antoniazzi and Iginio Sderci. In 1916 Bisiach moved to Siena at the invitation of Count Chigi-Saracini to restore his collection of instruments and establish a museum featuring them. It was here that he met and trained Sderci, who was to become the longest-lived and most prolific collaborator of the Bisiach family. The woodworking on Leandro Bisiach instruments dating from the early 1920s onwards is either by Sderci himself or makers that directly imitated him. These instruments are built rather consistently on a grand-pattern Amatise model and sport some of the prettiest materials and most refined workmanship seen in 20th-century Italian violin making. They do, however, generally lack the charm and spontaneity associated with Bisiach’s earlier, more artistically inspired production and, in my view, are therefore generally less valuable. What of Bisiach’s violin making sons? For the most part, their roles within the father’s own workshop were limited. While the two older sons, Andrea and Carlo, worked rather independently and away from Milan, Giacomo and Leandro Jr. were, it seems, mostly involved in the repairs and administration of the prospering business in Milan. By the mid to late 1920s the latter two opened their own business – Giacomo & Leandro Bisiach – modeled after that of their father. Initially they also used the industrious Sderci for all of the woodworking for their instruments, as did Carlo in Florence. It is mainly the varnish and in some cases the materials that distinguish the instruments of Giacomo & Leandro’s workshop in Milan from those of Carlo in Florence. Certainly, with the advancement of his sons, who by the mid-1920s were either makers in their own right or shrewd businessmen, Leandro had little need to worry about his or his family’s financial future. 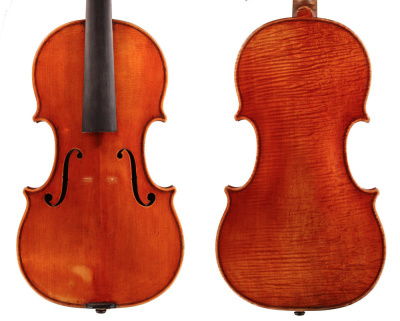 In correspondence with an American customer in 1928, Bisiach claimed that his violins were ‘varnished with a varnish of the authentic recipe of Antonio Stradivari’ and that the firm sold at least two grades of instruments. The best grade, ‘personal’ instruments, sold for about 50% more than the instruments of the second grade. Other, less prominent, makers who worked for Bisiach in some capacity include Vincenzo Cavani, Camillo Mandelli, Alberto Moglie, Pietro Borghi and Paolo Erba. I have never seen instruments entirely made by them and bearing Bisiach’s original labels and would therefore assume that their main contribution was as apprentices and repairmen. It is of course quite likely that, as was the case with Sderci, Bisiach would supply some of these makers with the materials and they would send him their instruments, or instrument parts, made in the white. Bisiach would then probably adjust the woodworking or perhaps add parts such as the scrolls, before varnishing them in his own workshop. In about 1932 Bisiach retired more or less permanently to his villa in Venegono. There he spent the remaining years before his death in 1945 in more leisurely fashion as a connoisseur of and dealer in old instruments. We can be certain that by this date Bisiach violins had no trace of the hand of Leandro Sr. himself. Like his violin-dealing predecessor in Cremona, Enrico Ceruti, Bisiach has the reputation of having been an unscrupulous, clever man, ready to go to any lengths for profit. 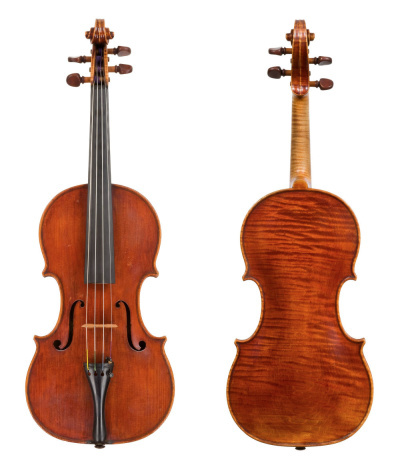 His attributions for old and important Italian instruments, often ‘adjusted’ in the woodworking or the varnish by him or his sons for enhanced salability, may rightly prompt a moment’s hesitation when considering the depth of integrity of the Bisiachs’ approach to violin expertise. Despite this, he should chiefly be remembered for his wonderful contributions to Italian violin making, and in particular to his fostering of the great modern Milanese school.